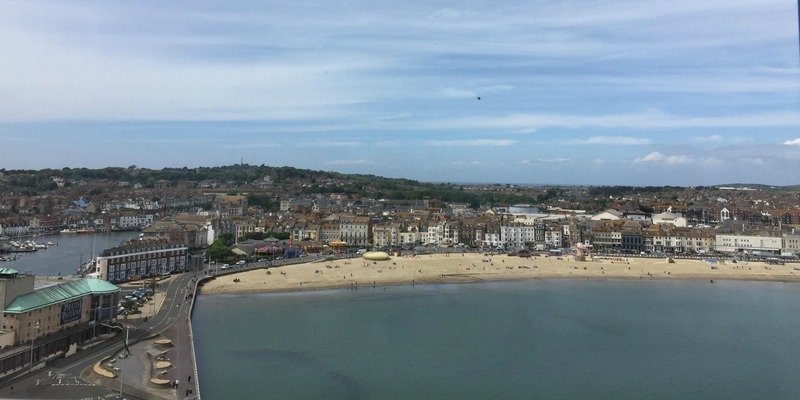 I haven’t visited Dorset since I was a child but, as I had such fond memories of our visits to Weymouth beach, we chose the South West coast as our UK holiday destination this year. 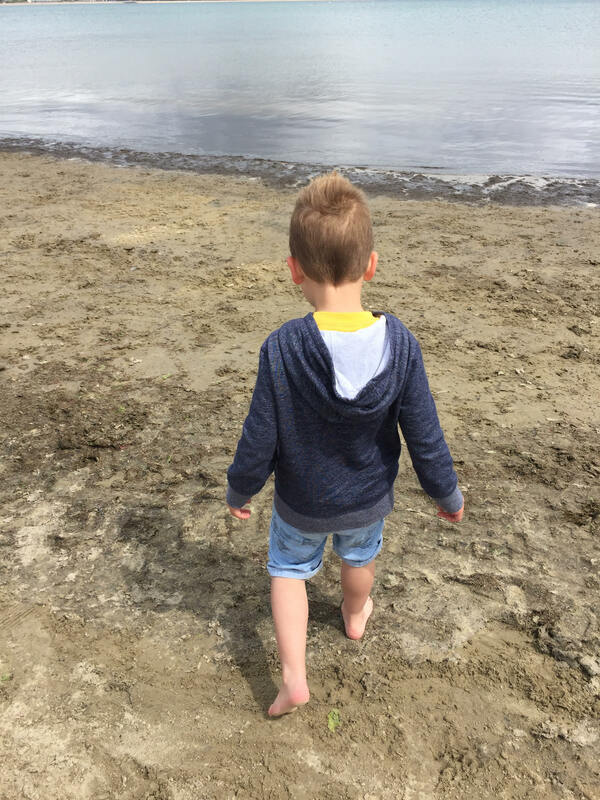 Truth be told we’d previously been put off by the four hour car journey but now Caterpillar is four we decided to risk it (we survived unscathed thanks to numerous snacks and screen time!). We had such an incredible time that by the end of the week I was considering moving there! I love my hometown of Southend but Weymouth’s beautiful beach, friendly locals and retro seafront fun far surpassed what we’re used to at home. In addition, Dorset’s hilly countryside is stunning. Simply driving around was a pleasure in itself as the rolling hills and adorable thatched-roof cottages were so lovely to look at. As well as looking great, this part of Dorset also has a lot to offer in terms of family fun. We packed a whole host of activities into our seven days and I’m sharing my favourites below. 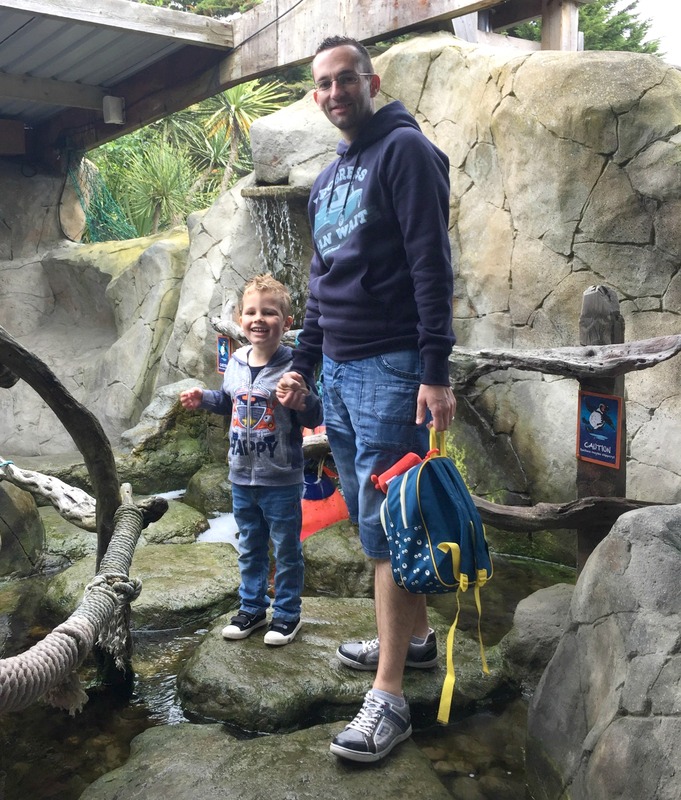 Easily the largest sealife centre I’ve visited, Weymouth offers lots of large exhibits which include jellyfish, sharks, rays & turtles alongside our bird & mammal favourites such as penguins and otters. There are lots of informative talks throughout the day and chances for interaction for the kids. Also on site is Caribbean Cove which is large, brightly coloured and water-themed adventure playground that my son was utterly obsessed with. The design is so cute and it spans all abilities. We also had a lovely lunch in the cafe as a bonus. 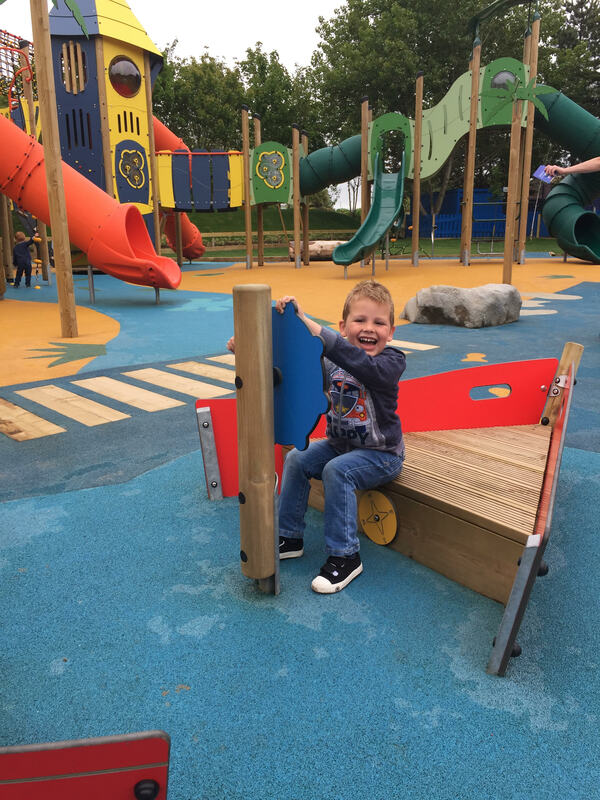 The sealife centre is part of Lodmoor Park, which has lots of other activities on-site so it’s helpful to have several things in one place when you’re on holiday with kids to entertain. Lodmoor Park is also the home of Sandworld, a truly breathtaking sand sculpture exhibit from Mark Anderson. Mark’s grandfather, Fred Darrington, delighted visitors for nearly 70 years with his seafront exhibit; creating the large, beautiful sculptures using Weymouth’s famous fine sand. Mark and his fellow artists then moved the exhibit to Lodmoor Park. We weren’t really sure what to expect when we arrived and were completely taken aback by the enormous works of art. It’s almost impossible to believe that such detailed sculptures are actually made from only sand and water! From a homage to David Attenborough’s work to the Finding Dory centrepiece, the sand art covers a whole host of topics and the detail achieved is truly staggering. The coloured pieces in particular are amazing (how do you paint on sand?). Even at only four-years-old, Caterpillar was impressed and engaged, proving Sandworld certainly brings something to all ages. Each piece includes information about the artist, which was really fascinating to read, and we also loved looking at the wall of photos showcasing all the other sand sculptures that have been created and displayed in the past. Afterwards you can have a go at sand sculpting for yourself which we all found really fun (and the difficulty of it only increases my awe for the artists!). A great place to visit and really different from the norm. Our trip to Abbotsbury was probably the best day of our whole holiday. 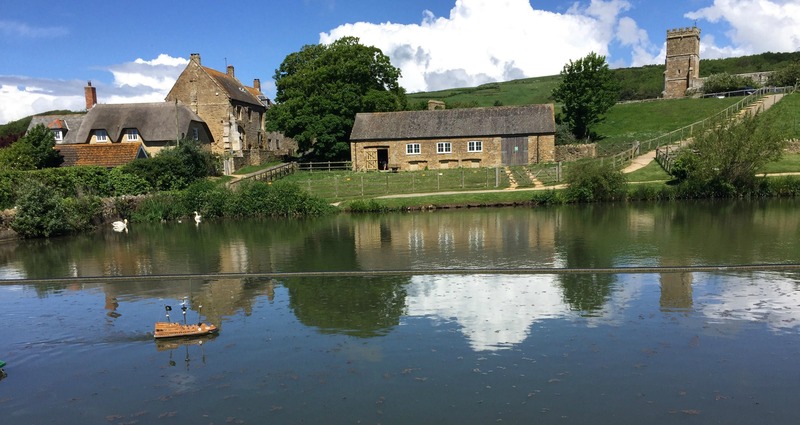 A beautiful village of country lanes and gorgeous stone properties, Abbotsbury also offers three family-friendly attractions. The children’s farm is absolutely adorable and set in such a picturesque spot. Caterpillar is a huge animal lover and he adored all they had to offer. Bottle-feeding the lambs was a brilliant experience for all of us, and Caterpillar also loved cuddling with the guinea pigs and going for his first ever pony ride. 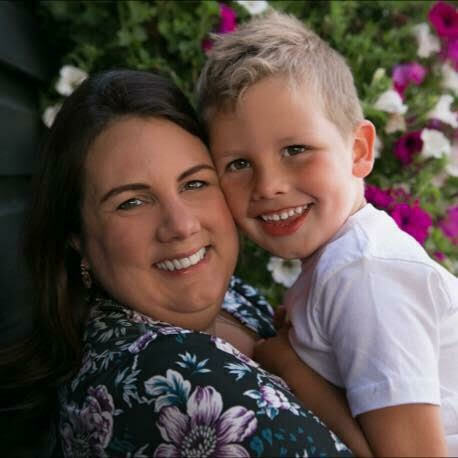 The staff were so friendly and helpful, and the extra attractions – soft play and indoor activities, remote control pirate boats and mini tractor park were really appreciated. After the farm, we took a lovely walk through the impressive subtropical gardens only moments up the road. Sadly, my husband and I are not particularly green-fingered so I fear some of these beautiful gardens were wasted on us but there is no denying it’s huge and impressive collection of plant-life and the lovely way everything is laid out. If we lived nearby we would definitely be buying an annual pass as it’s a really beautiful place for walking with dogs and children alike. I feared after the excitement of the farm, Caterpillar would be a little bored and antsy in the gardens but he loved it! Mainly because he took it upon himself to lead us around using the arrow signs and this very much kept him occupied. The real highlight of our day in Abbotsbury, and our trip as a whole, was the visit to the swannery. We really didn’t know what to expect and were quite overwhelmed by the experience. 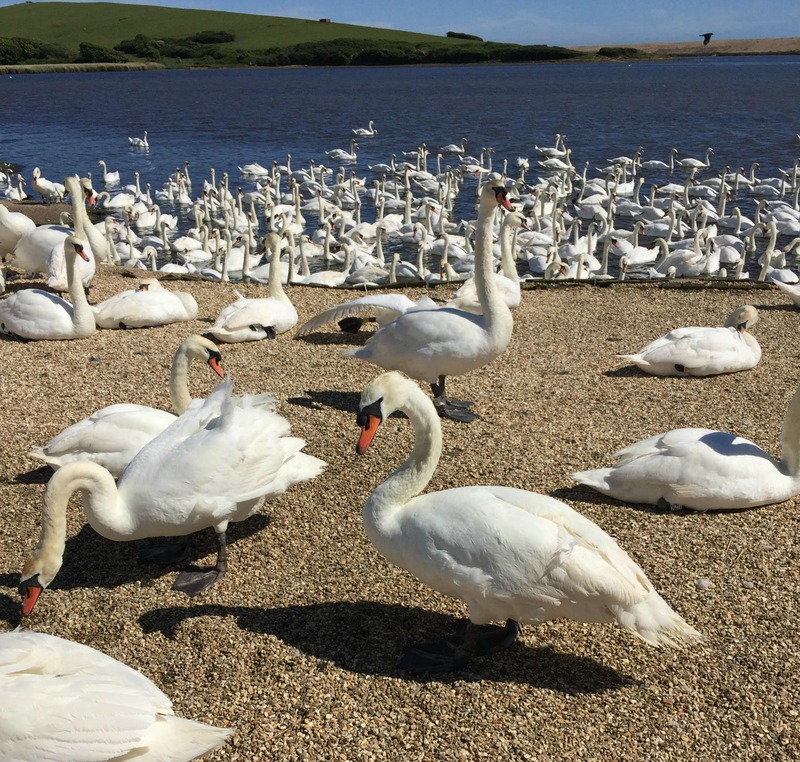 Home to the world’s only managed colony of nesting mute swans, it’s so hard to explain the wonder of Abbotsbury Swannery to anyone who hasn’t visited. 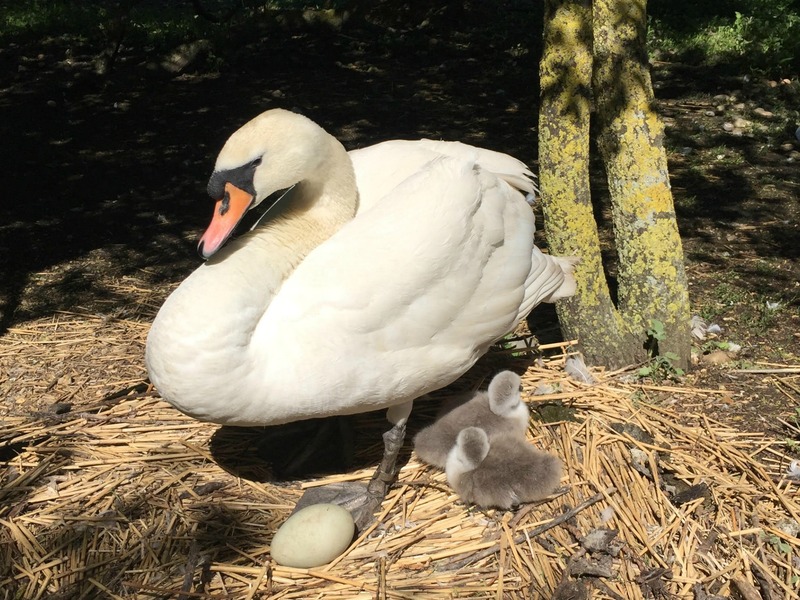 Our timing was particularly good as the very first cygnets had hatched just days before and there were many other nesting pairs still waiting on their eggs. We were warned before we arrived to be careful where we stepped as there were eggs and baby swans afoot but, even then, I had no idea the close contact you could have with the birds. The cygnets were so adorable but, aside from the new families, the sheer volume of non-nesting swans coupled with the beautiful coastline was almost magical. Embracing the opportunity to feed the swans too was the icing on the cake. Frankly, my husband, son and I were left a little spellbound by the whole experience and photos really can’t do it justice. This is a monkey sanctuary like no other. The area is very unassuming when you first arrive but you soon discover how truly huge this park is. The enclosures are easily the best I’ve ever seen and, frankly, make most zoo environments look disturbingly small. 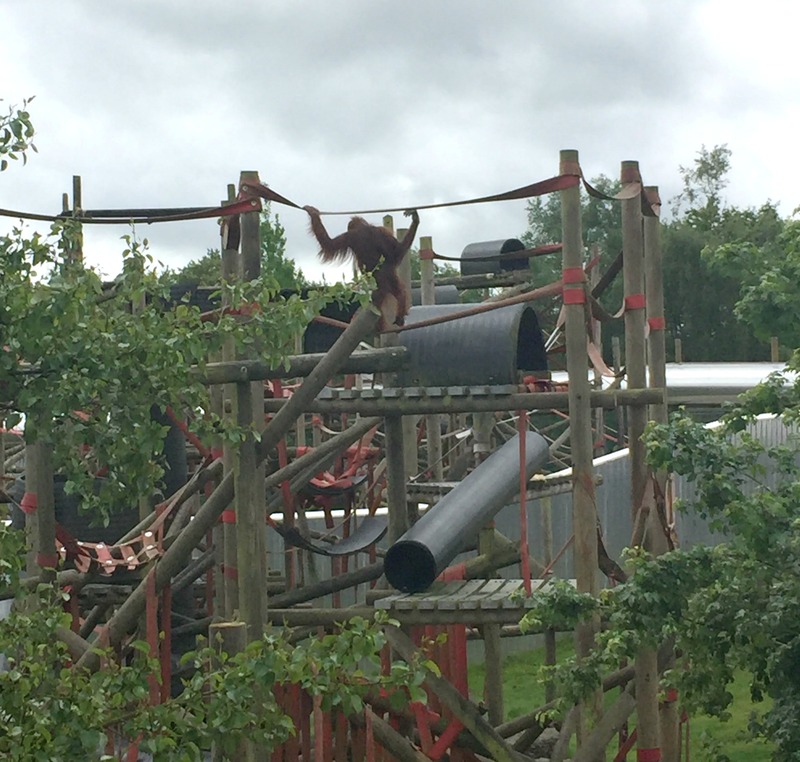 As well as a large amount of space, all the enclosures are kitted out with lots of play equipment to stimulate and comfort it’s occupants (Caterpillar was quite jealous of the chimps and would have liked to have jumped in and done some climbing himself!). Something that appears to delight both the monkeys and visitors alike is the connecting tubes that go across the walkways, above visitor heads, for the smaller primates to cross from one side of their enclosure to the other. We spent ages watching the gorgeous animals dart back and cross, a lot of fun for them and us. 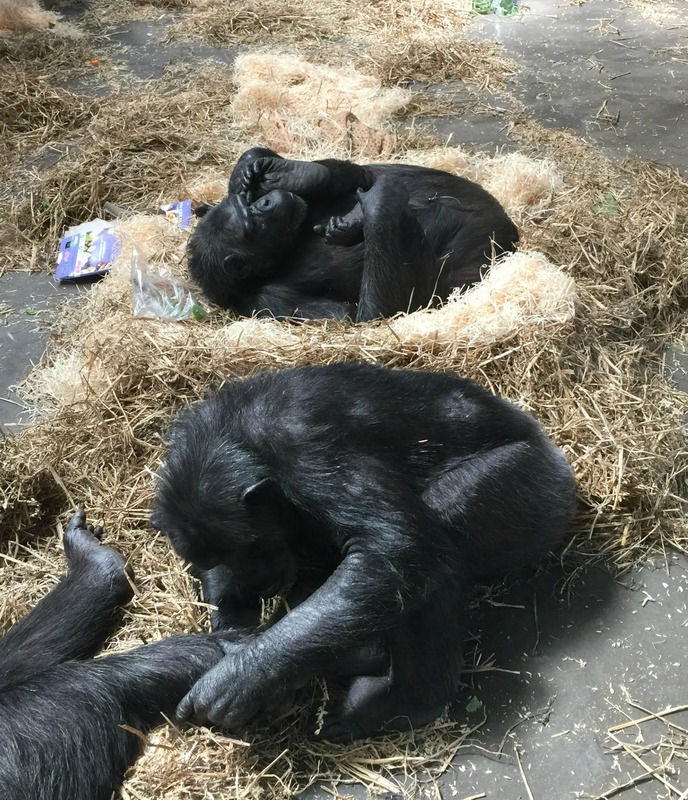 Monkey World is home to an enormous number of apes and primates – most of whom have been rescued from horrible fates in labs or from being mistreated in the tourism industry. It is clear from the moment you meet the first inhabitants that the care and well-being of the animals is the number one priority of staff at Monkey World. Each creature has a story, many of them very sad, but they all have a happy ending as they are now so well cared for. The range of species is very impressive too – I didn’t even realise there were so many kinds of ape and primate. Monkey World have everything from gibbons and marmosets to orang-utangs and a very large collection of chimps (four individual groups, in fact). The keeper talks are particularly impressive. Much longer and more detailed than usual zoo talks, we found what they had to say fascinating and it was lovely to be able to clearly see the passion and interest the staff have in the animals they take care of. 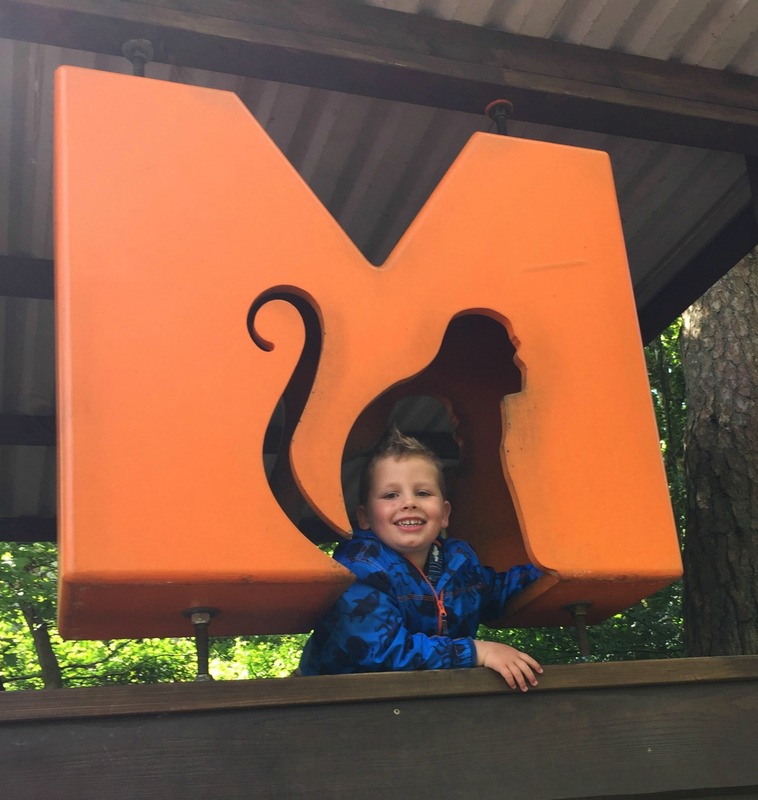 As well as the monkeys themselves, Monkey World has several large play areas and food outlets to keep the kids happy too. 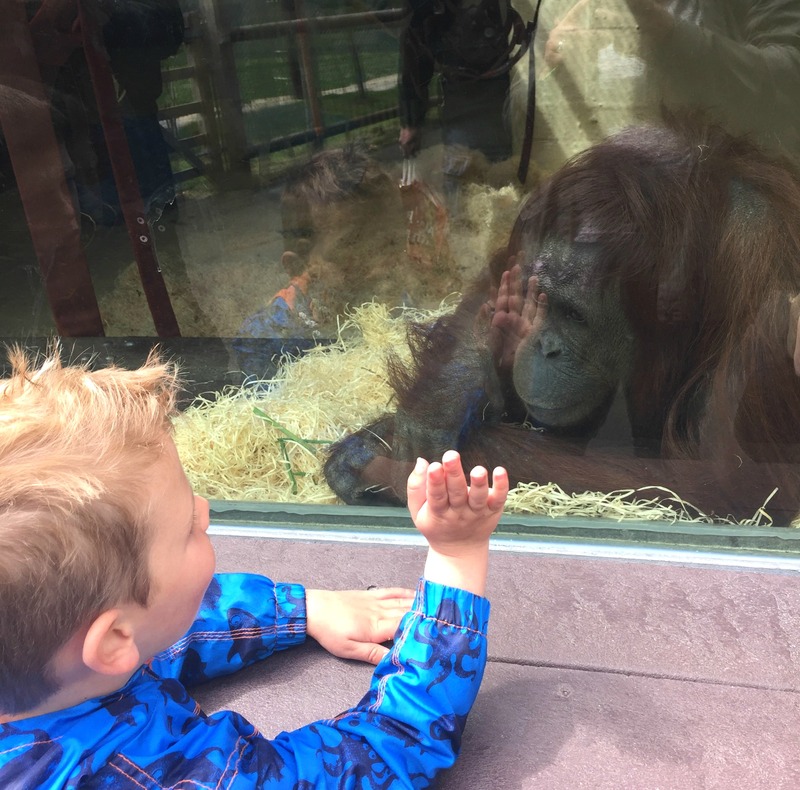 All three of us had a fabulous time, with both the chimp talk and this close up with an orang-utang being particular highlights. As mentioned, the stunning coastline is a real attraction to this part of the country and there’s no better way to see it than from the Jurassic Skyline. At 165ft up, this rotating, glass capsule offers unrivaled views of the stunning coastline when it slowly rotates a full 360 degrees. As someone with a lifelong fear if heights I was a little nervous to say the least, but once at the top the horizon is so beautiful I quickly forgot my nerves. You can’t go away in the UK in May and not expect some bad weather and unfortunately we did face a fair few downpours. Determined not to let this ruin our holiday we chose the wettest day to visit two lovely museums in the pretty town of Dorchester. Caterpillar and I are huge dinosaur fans (my husband not so much – he hasn’t even watched Jurassic Park, the fool) so we were really keen to visit this exhibition. Despite being only four, Caterpillar was so enthralled with the dinosaur bones, replicas and fossils on display, he loved pressing the buttons on the interactive pieces and watching the dinosaur documentary in the cinema room. 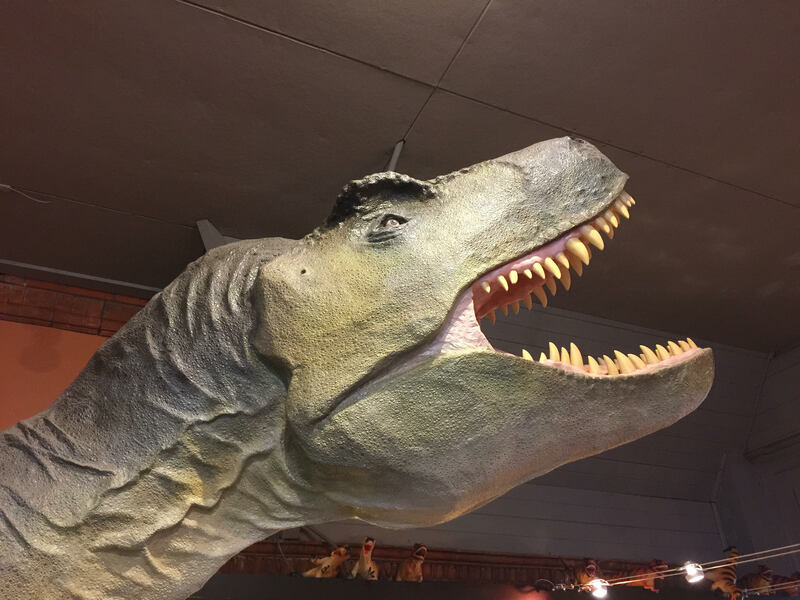 This is a great little visit for any dinosaur-loving preschooler! Just around the corner is the Teddy Bear museum which again was a surprise hit with our little one. Personally, I really enjoyed the displays of famous bears through the ages – such as Paddington, Sooty & Rupert. An endearing display for adults and children alike. A Gold Saver Pass gains you entries to three addition museums too – The Tutankhamun & Mummies Exhibitions and the Terracotta Warriors. Sadly, we didn’t have time to visit all of them this time. I simply can’t write about this part of the world without a few words about the beach itself. 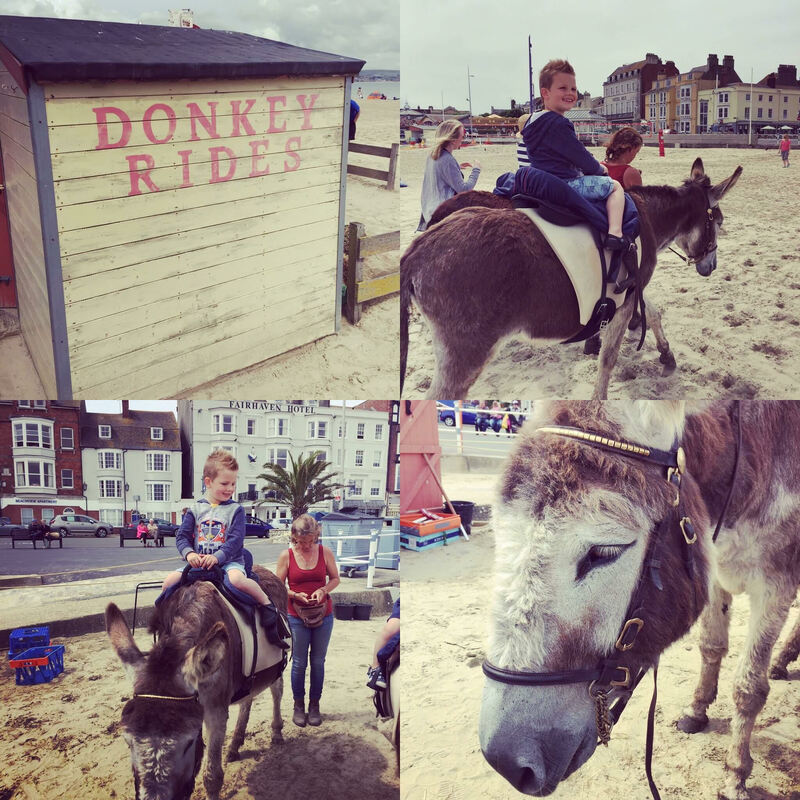 The purest sand, beautiful views and retro kids entertainment make Weymouth a real treat for any family. Caterpillar enjoyed bumper cars, donkey rides, swing boats, crazy golf and some truly cracking fish & chips and ice cream. The shops and surrounding area are wonderful too and I must give a special mention to my new favourite store – Fossil Beach, I would have happily spent all day in there. With so much to see, do & enjoy we will definitely be returning to Dorset again soon. Disclosure: This is a collaborative post, all words and opinions are my own.